How often have you been craving celery and opened your crisper drawer only to find wilted celery stalks? Celery has a special flavor that lends itself well to soups and stews, but it's so hard to keep fresh! That's why you should try dried celery. It stores for years on your pantry shelf and you will always have the fresh taste of celery at your fingertips! No more chopping or worrying about spoiling. Dried celery flakes will make the perfect addition to your kitchen! If you like dried celery, you should also try freeze-dried celery! Both have a fresh celery flavor, but there are some key differences that set them apart from each other. 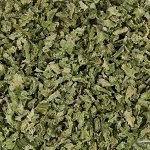 Dehydrated celery lends itself best to being used in cooked dishes while freeze-dried celery can hold its own as a fresh celery replacement in many dishes. The freeze-drying process allows celery to hold it's original cellular structure while just extracting water. Dehydrating celery is a slower process that causes the celery to shrink in size as the water is extracted. And while freeze-dried celery may only expand to slightly in size when you add water, dehydrated vegetables can as much as quadruple in volume! Cook times between the two vary as freeze-dried rehydrate almost instantaneously and dehydrated takes 10 minutes simmering or one hour soaking. So now that you know the difference, you can choose which one is best for your cooking endeavors! This light and savory soup, featuring dried celery flakes, is easy to make, healthy, and a welcome addition to any meal. Bring water to a boil with potato, dehydrated celery flakes, and onions. Simmer 10 minutes. Add remaining ingredients and simmer 5 more minutes or until vegetables are tender. Blend in a food processor in small batches until smooth. Or, if you like a chunky soup, skip this step. Serve warm and enjoy! Dried celery is great for everyday use as well as for backpacking and emergency food storage. It's lightweight and compact size is perfect for the trail when added to a soup or stew! You can grind it and mix with an equal part of sea salt to create your very own, freshly ground celery salt!